It looks like the monster El Nino hinted at in the work of scientist Kevin Trenberth and written about here for the past year and a half may now be starting to show her face. West winds blowing over Western Pacific waters hit near record strength (for this time of year) and substantial length over the past couple of weeks. Model forecasts mostly all show a strong to unprecedented El Nino peaking out by mid Fall 2015. 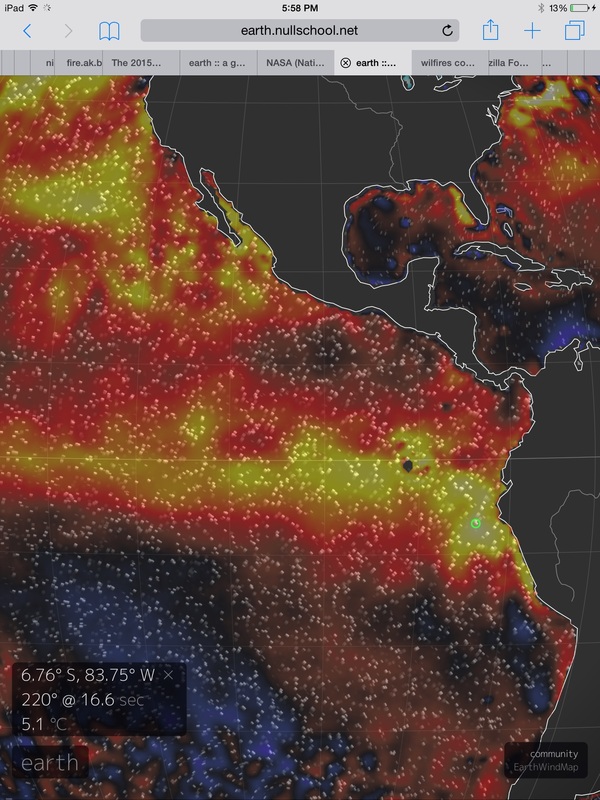 And now, sea surface temperatures in the Eastern Pacific are starting to look freakishly hot. 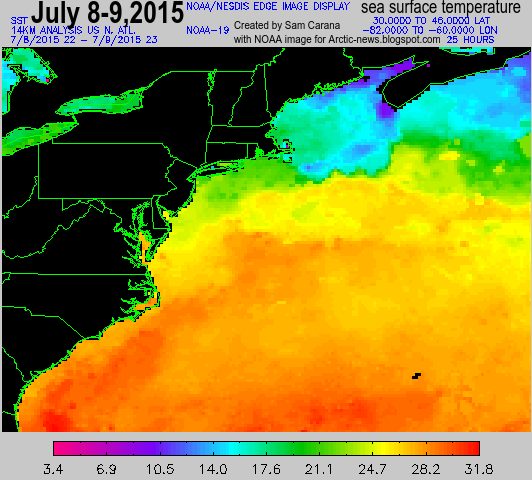 For over the past few days sea surface temperatures in the Nino 1+2 and Nino 3 zones have really warmed up. Waters just off South America have grown particularly hot with much of the box covering 80 to 90 degrees West and 0 to 10 degrees South showing temperatures above 3 C hotter than average. A large area of this warm water pool features hot anomalies above 4 C with peak readings in the measure hitting an extreme +5.1 C anomaly. Running along the Equator and into the Nino 3 zone, wide regions of ocean now feature +2 to +3.6 C positive anomaly readings. Overall, these are substantial jumps from last week and finally put the Eastern Pacific in an anomaly range comparable to the blob of hot water off the US and Canadian West Coasts. According to NOAA’s Weekly El Nino update, sea surface temperatures in the Nino 1+2, Nino 3, and Nino 3.4 zones hit +2.7 C, +2 C, and +1.4 C positive anomalies respectively. More recent sea surface temperature analysis like the one above hints at continued warming in these three zones over the past few days. 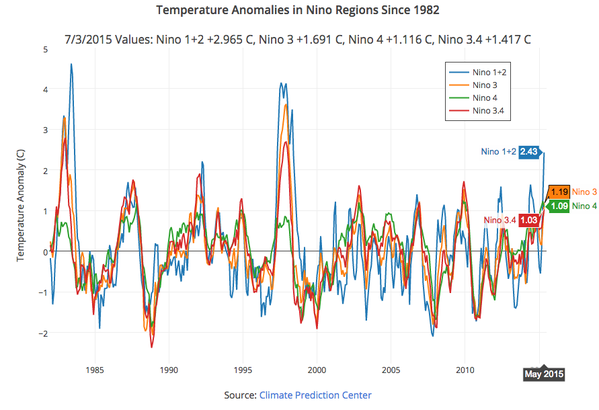 By contrast, the above graph shows highest monthly values for the record-breaking 1997-1998 El Nino at +2.6 (Nino 3.4), +3.6 (Nino 3) and +4.1 (Nino 1+2). The new readings over recent weeks shows the current El Nino starting to close the gap. But with many weeks and months ahead for El Nino development, we are still in the formation stages even after more than a year of build-up. And the hot water pool in the Northeast Pacific, providing an amazing ocean and atmospheric spring-board for the rising El Nino to push off against, gives us a few hints as to how extraordinary that build-up may be. With El Nino really starting to look nasty and the world already well into new record hot temperature ranges it certainly looks like Dr. Treberth’s warnings are bearing out in dramatic and unpleasant fashion. The comment I just posted is currently in moderation due to its containing a video, but I believe the video may seem especially pertinent to this post’s topic. Seasonal anomaly model fan ( grouping with mean). I was referring to the CFSv2 in non PDF correct as used by Eric, but for the Thursday posting at NOAA. Thanks for the link. Saw this fan earlier and it’s pretty impressive. With the current fire season leaving a significant area burned, if it is followed up with significant precipitation then mud slides may be the result. Oregon, Washington, BC being especially vulnerable. No matter what, that heat would reemerge sooner or later. This could be bad, but further delay could make it worse. Exactly, Andy. Good thoughts. I think what we are seeing is an energy inertia interplay. You have polar amplification on one end standing in the way of the typical final phase of a strong El Niño. But the result is that more of the human heat forcing builds in the equatorial ocean. At some point, the polar inertia is over-ridden by a huge heat plume at the equator. The longer this takes, the stronger the plume. Robert, I’m sitting here tonight and just heard what I thought was rain (San Francisco Bay Area) I’ll be darned if I look out the door and IT IS raining. I don’t ever remember it raining in the middle of summer (lived here all my life) I got a foreboding of something wicked this way coming. Thanks for all your great reports and writing. Thumbs way up. There’s an amazing plume of moisture surging up over the Pacific. An ongoing flood that is now 10 months involved and building with each passing day. 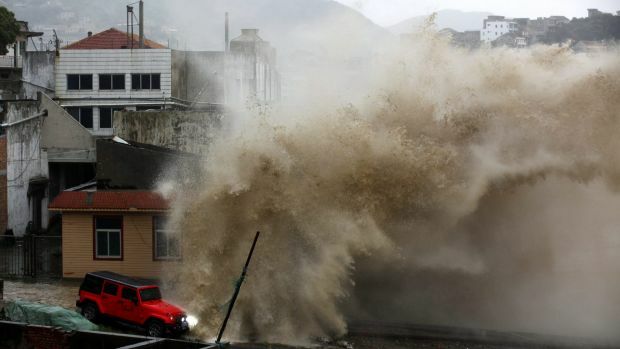 It slammed into Alaska as the worst storm on record there last November. If the block falls, that plume takes a right hand turn, gets an even greater moisture boost and the slams directly into the West Coast. But the size of the equatorial T anomaly required, with the Arctic warming so much and with sea ice so weak, is absolutely astounding. So we do have this kind of wicked synergy between global warming, related polar amplification, a monster El Niño, and concerns over extraordinary weather. I have friends who are moving from New Hampshire to coastal Oregon this fall. What should I tell them to prepare for? I understand they’ll be about 10 miles inland. Prepare for the possibility of some of the worst storms ever recorded in the modern climate record if the block fails. If the block maintains, the very bad weather is heading for Alaska instead. Follow up to my question above: Does the NEPAC high-pressure block need to substantially weaken before ‘normal’ El Nino rains can be expected from CA up to the PNW? Thanks Robert. You answered both my questions in one short post! You’re certainly welcome, Mark! Hope it helps at least a little. 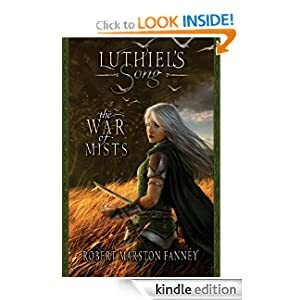 Given Robert’s highly insightful writing, his blog is one of a handful of places I visit each day, often several times a day. I am generally quite impressed by the breadth and depth of his understanding of climate. Tim — your comments make me a sharper writer and researcher. So the feeling is absolutely one of mutual admiration. I am an economist by training. Cap and trade has failed to date because of implementation issues. Poor and ineffective emission targets, scheme leakage via grandfathering and exemptions such as trade exposed industries and other special interests industries. Finally, a lack of an international agreement. Under these circumstances, carbon tax would also fail. In an environment where targets or caps need to be placed urgently on emissions, cap and trade is the best scheme – set the quantity to the emission target or cap and lets the price of carbon adjust to meet the emission target or cap. Carbon tax, on the other hand, fixes the price of carbon but then you lose control over the quantity side of the ledger – you cannot guarantee that a fixed price will achieve any desired emissions cap or target. Carbon taxes work best when you are slowly transitioning into carbon constrained economy and do not have strict urgent carbon constraints operating. This operating environment is long gone. Also very hard to see how you get international harmonisation of carbon price internationally without some international price based competition mechanism unless each and every country is willing to give up their own sovereignty in relation to their own carbon abatement policy to some international oversight body which sets their emission caps, which is unlikely. The problem with cap is that ‘allowable emissions’ soon become ‘government mandated emissions’ in an environment in which ‘zero emissions’ is the desirable outcome. A tax or fee, on the other hand, preferentially enables non carbon energy, generating an economic environment in which emission based processes are handicapped to the point of winnowing out. This has been especially true if the penalty is in the form of a feed in tariff or other fee/tax + clean energy adoption incentive. Historically, feed in tariffs or fee + incentive have been so successful that they disruptively transformed economies — see Germany and Australia. And this is the kind of high speed transformation we need at the moment. Incentive alone has been strong enough to result in substantial gains (see Georgia/UK EVs, California etc, etc). The history for cap and trade, on the other hand, has been fraught with failure. Failure to the point that in some cases cap and trade resulted in emissions increases. In this case, history is not providing very much in the way of support for that economic point of view. Stiglitz seems to agree. So if we are looking for most effective solutions, I think fee or tax + some kind of non carbon energy adoption incentive is probably among the most powerful monetary levers. To me, the only difference between cap and trade or carbon tax scheme is that the former involves setting emission constraints and letting the price adjust to meet them while the latter involves fixing the carbon price and letting the emissions adjust accordingly. In Australia, you will need a combination of things to drive emission reductions. Renewables energy targets might drive around 10 to 12 per cent reduction (including small and large scale schemes and current targets). However, coal generation is still very competitive and all renewables do via the merit order effect is replace cheap renewables with most expensive thermal – here diesel or peak gas. Cheap coal, especially brown coal is not affected at all. A carbon price would affect them much more by altering their marginal and average costs relative to gas (but also depending upon what happens to gas prices) so gas replaces coal. Feed in tariffs are the best way to promote renewables probably via a contract for difference mechanism – only provide difference between sum of wholesale price plus any other market revenue such as from renewable energy certificates and PPA and the long run marginal cost. However, even in Germany with all the support, only likely to get to around 25 to 30% of total generation with current settings and plans and in Australia, large scale around 3 to 5% and small scale, a couple of extra percentages. So along way off 100 renewables. Certainly have feed-in tariffs promoting renewables at the same time as carbon pricing. Tax them to the point where they are more expensive than renewables. This shouldn’t be hard at all in Australia where renewables are already eating coal’s lunch and coal is now requiring policy support from the neo-liberal (Abott) government to stay afloat. In fact, if Australia had just stayed the course and had not suffered Abott coal would be on its way out now. In all honesty, I find it hard to believe you’ve missed the policy impact of Abott’s coal retrenchment. Globally, the cost of coal power generation is flat or rising, the cost of renewables keeps falling. In many markets, new renewables out competes coal directly. Added tax is a coupe de gras to coal in this environment. So how are you missing this clear underlying trend? In any case, regardless of your economic theory orientation, cap and trade has an amazingly terrible record historically and, from my view, anyone taking that approach opens wide the door for manipulation of all kinds, as has happened in fact. The tax policies, on the other hand, are right now shutting down coal plants. In my view, we need more of that. Most of the coal generation plant is old now and capital costs are largely or completely amortised. Thus no longer comparing apples and oranges. Newer projects including renewables have to cover levelised costs (e.g. long run marginal costs) while older coal plant just need to cover much lower short run marginal costs. Cheap coal prices lock in this competitive advantage for older coal plant. Off course, operators of old coal plant will eventually have to decide whether to refurbish the plant or shut it down. To date, most operators have decided to mothball this type of plant largely due to existing large excess supply capacity that exists because of reductions in average and peak demand arising over the last five or so years in response to uptake of residential solar PV and declines in manufacturing. The hope this that this will continue to occur although the El Nino might potentially increase average and peak demand, thus shaving the extent of excess supply capacity. So think about it this way. If you tax carbon based on emissions, then the old coal plants get hit the hardest, speeding mothballing of the worst emission sources. But if you cap and trade, and grandfather and loophole, as has happened, then old coal just keeps chugging along. I agree that on paper cap and trade works out well. It’s just so open to complication that it hasn’t worked out in practice. I think it’s an issue in that it adds in too many potential human psychology driven factors, which is probably a reason why it hasn’t worked outside the idealized scenario yet. Carbon tax will face the same problems as cap and trade if implemented in a similar manner or framework with, for example, rules allowing loopholes, leakages by excluding or grandfathering certain industries, weak emission targets and lax banking rules, In this circumstance then the same problems that have beset cap and trade will also beset a carbon tax scheme. The Gillard Government had a carbon tax scheme which had both grandfathering and exceptions of trade exposed industries. Until Governments get serious about combatting climate change and set hard binding emission targets, both cap and trade and carbon tax will struggle. Both require a similar institutional environment to work properly. False equivalency again Phil… We have carbon taxes that are working now. Shutting down coal plants now. We have yet to see a cap and trade scheme that is doing the same. I’d say a carbon tax is needed. Let’s be clear about it. If the carbon price is merely another carbon trading scheme, we could end up with more emissions, not less. Cap-and-trade is the first thing Stiglitz (the economist referred to) dismisses. I understand that. But carbon pricing has a muddied definition now. We should be bold and push for what is needed and not hide behind double-speak. So the criticism is more for the wording and less for Stiglitz’s intent, which I’m sure you’d appreciate. Let’s be very clear. The article leads with a statement that ‘cap and trade is doomed to fail.’ It then goes into a lengthy diatribe as to why. And, in its concluding statement, it proposes a solution in which there’s a global ‘carbon pricing’ system in which countries choose between a carbon tax and cap and trade. Given the original statement in the article, isn’t this shooting ourselves in the foot? If some countries choose a carbon tax and some choose cap and trade, isn’t this an uneven playing field that invites cheating by bad actors? Seems to me that this particular messaging wasn’t very well thought out. The truth here is that cap and trade is a real economic and political barrel of worms that invites manipulation and opens wide the door for extending carbon emissions. A carbon tax, as unpopular as it is among the exploitative business special interests of the day, is a much more effective tool for rapid carbon emissions reductions. But a global system that includes both invites a rigged game with clear economic winners and losers, one that may find a decent allegory in the way in which entering the Euro has negatively impacted Greece while benefitting Germany. I’ve said it before and I’ll say it again — playing zero sum games with climate change is a stupendously bad idea. It’s good to see this ball rolling and kudos to Stiglitz for pushing it and to the scientists lining up behind it. In my view, it’s pretty important that the chips fall on the side of a carbon tax, though. But any across the board cuts to fossil fuel subsidies, as also proposed, is a huge net win for those promoting responsible action. A huge problem with carbon tax in America, (and this from a Massachusetts resident, we are closer than other states) is that those who are pushing for the tax are content to work with the pols, on the schedule that the pols deem appropriate. So we have situations where activists feel like a tax that may be implemented five years from now, and starts at a ridiculously low carbon price of $10/ton, would actually be meaningful progress on our fossil fuel addiction. If reading this blog has taught me anything, it’s that we just don’t have that kind of time. So I am careful in thinking that a carbon tax is the path to success that I once thought it was. At least without aggressive implementation it is not. Sadly, too many are willing to accept the moral victory of bill passage as “action enough”. In my opinion, a carbon tax will only help us if it is not one that is priced so as to be “acceptable to the union”, but is based on the reality of our situation, and priced so as to impart serious movement away from fossil fuels. I just really wish that more business leaders would realize that soon enough, no matter where on this planet the revenue is generated, they too will suffer the ill effects of our addiction. Have to agree wholeheartedly, any carbon tax now would necessarily have to be substantial and immediate to have the kind of impact required by the radically ramping intensity of the climate crisis. We should have had a carbon tax in the 80s. That may have stopped most of the damage. Right now, we are looking at stopping collapse and/or extinction. So a carbon tax would have to be substantial as well as substantially augmented by additional policy. The “across-the-board” model (ATB), which uses the revenue to cut California’s sales, income and corporate taxes by a proportional amount. The “fee-and-dividend” model (FAD), which returns the revenue in equal amounts per person to every household in the state. Both increased real disposable income for the average California household by $16,000 by 2035. But cutting taxes resulted in almost $250 billion in additional cumulative GDP by 2035, while handing out checks only added around $60 billion by 2035. The bit about lowering taxes resulting in higher GDP isn’t surprising, but there is the benefit to fee-and-dividend that it helps those who otherwise might be unable to afford the needed changes, e.g., getting rid of the old gas hog parked outside of their apartment. Of course fee and dividend would result in growth. A high quality kind of growth not subject to the typical weaknesses the income inequality enhancing tax cuts tend to produce — bubbles, social unrest, malinvestment, exhaustion of economic systems. In addition, the approach incentivizes sustainability and reduction of damage to the commons by making a direct hit against bad actor behavior. For this reason, I’d call the tax cut based growth a bit ephemeral while the dividend based growth looks much more solid from where I’m standing. It also turns pure capitalism on its ear while not wrecking an incentive based system altogether. I’d call this solution elegant and inspired. I am open to either across-the-board (ATB) or fee-and-dividend (FAD). The first will appeal to those who are interested in maintaining a free market. In fact someone who has taken the Norquist pledge of no new taxes has no grounds for opposing a pure ATB. The second will appeal more to american liberals. But for me ideology is secondary. Depending upon what we do over the next few decades, we may end up emitting enough carbon dioxide that (as David Archer points out) much of our carbon emissions will only be gradually brought down over tens of thousands of years and as the result of geological processes. Assuming we continue with business as usual and then burn the non-traditional fossil fuels (e.g., shale, tar sands, synthetic oil from liquefied coal), and yet avoid some of the nastier scenarios we’ve touched on here before, the planet is going to look very different. There will be the dried out continental interiors due to oceans having higher thermal inertia than land. Absolute humidity may remain the same as moist ocean air blows inland but the higher inland temperatures will mean that the relative humidity drops. Less moisture reaching the soil and what moisture is in the soil evaporating more quickly will dry out the soil and result in the loss of vegetation that might otherwise hold on to some of the moisture. This will reduce moist air convection which will result in higher surface temperatures. The expanded subtropics will likewise dry out much of the globe, including the US. And one of the points where models fell down was in terms of modelling the rate of expansion. The subtropics were expanding at three times the rate that the models were showing. But we may be doing a better job of modelling the expansion nowadays. Meanwhile more rain will fall at the higher latitudes, e.g., in Canada. But as the rate of evaporation and absolute humidity roughly doubles for every 10°C the water cycle will contain more energy, resulting in stronger storms. Flash floods become more likely. Some of this rain will occur even in the otherwise desiccated continental interiors. But as there will be less vegetation and roots to hold on to the top soil much of the rich soil that makes farming possible in the US today will be lost to the sea. In time there will be more bare rock, and with harder rainfall carbon dioxide will be slowly, naturally sequestered through the process of mineralization. The negative feedback that operates over tens of thousands of years. Meanwhile the coasts will provide some solace from the baking of the continental interiors but cities will keep having to be moved inland — and we will no longer be able to afford the high investment in infrastructure. And of course even once the temperatures plateau the oceans will continue to rise with the melting of the ice, the loss of glaciers and the ice sheets that reside on land, and most importantly the expansion of the oceans. Harvests from the mid-latitude farms will all but disappear. The high latitudes may take over to some extent, but so much of the soil has been locked in ice, will subside with the thermokarst lakes. Rocks will have to be cleared. The high latitude soil will provide a poor substitute for what had once existed in the mid-latitudes. Tundra is acidic and brown forest soil becomes acidic with increased precipitation. And of course the infrastructure to support farming will be largely missing. But with temperature continuing to rise more quickly in the high latitudes than the rest of the globe it won’t make much sense to invest heavily in farming. Whatever crops the land might support will tend to be gone a few decades later. Much of our ocean harvests come from the coral reefs which act like tropical rain forests in preserving diversity in an otherwise largely desolate ocean. But coral reefs will largely disappear due to periods of high temperature and increased acidity. And the latter of these will eat away at the calcareous protists that lie at the very base of so much of the ocean food chain. Increased drought and the occasional flooding will put at risk much of the fresh water supply — already threatened by our depletion of the water tables and many of our freshwater lakes. Rising ocean levels will likewise result in the contamination of water tables by salt and even red algae. Stronger storms will likewise contribute to this. With shortages in freshwater you will see people increasingly relying on whatever water they can find — despite the risks. And the risks will include waterborne illnesses. The places that are hardest hit will become a breeding ground for di sease. Likewise the resource shortages will make people desperate, vulnerable to extremist ideologies — and with war comes the spread of further disease. Anything that I might be tempted to call civilization probably dates back only 10,000 years. Even if we simply ignore the extinctions, we may be looking at something that takes the planet 100,000 years to recover from. Against that any human ideology is fleeting. The free market these days means different things to different people. And because conservatives have become so extreme in this country, many who would be lumped into the liberal category support what traditionally would have been more market preserving solutions. ATB is what the EPA is now attempting. It’s a mild ATB carbon emissions reduction of 30 percent. One that is regulation driven and one that is getting staunch opposition from conservatives. I support the EPA’s approach, but the current rate of reduction is no-where near fast enough. A 30 percent reduction is also meaningless unless future reductions brand emissions to zero, or better, net negative. I’d call the EPA action a more traditional approach. Yet it is one that has received serious opposition from conservatives on ideological grounds. Ideology, in this case, that is basically opposed to any government action on anything except a handful of destructive pet interests (government support for fossil fuels being one). ATB reductions in this case were a very light handed approach by government when compared to other options. FAD isn’t something I’d call ‘liberal.’ It is revenue neutral, and basically doesn’t grow the government. From my point of view, as a liberal, I see this as a detractor as I think that government has become too shrunken, too privatized, and rendered too weak to deal with serious larger crises on the way. That said, I’d set aside my ideology to support an FAD approach due to its combined potential to further and more rapidly reduce carbon emissions as well as reduce income inequality which I see as a serious civilization crushing component and one that is a component of the climate crisis. So though FAD is not as public sector enabling as I would like, it will certainly do if idiot conservatives would wake up and realize we have already met them half way. My last point is that saying that every political stance is equally to blame in this crisis is ludicrous. Liberals have been seeking solutions, even market oriented solution, on climate change for decades now. We have done everything possible, even tried cap and trade which the conservatives sand bagged or wrecked. We have, at times, gone along with reductions in public supports and later regretted it as those reductions were damaging — reducing our resiliency and ability to respond time and time again. We have now gotten to the point that any further progression along the path toward privatization and a pure free market is civilization crushing in itself. But what is worse is the same free market ideologues who are wrecking stable economies are also wrecking stable climates — basically doing everything possible to force dependence on destructive fuels. This is pervasive and it is global in nature among the conservative, neo-liberal set. In addition, the particular scenario you describe only includes a few of the potentially most destructive outcomes. So, yes, we really need to get everyone on board and not turn this into another attempt at a market free for all. One that will not help at all in either carbon reductions or civilization resiliency, one that right now is making matters far worse. In this context, in the context of the current political reality in which republicans are fighting to kill the EPA and ATB carbon reductions, any vote for that crazy party is basically shooting ourselves in the head. First, thank you. You are very brave. Second, how unusual is “blob of hot water off the US and Canadian West Coasts.”? I know it has been present and growing for a while now, but how unusual is it? Third stay strong. There is hope, there is always hope. The hot blob is unprecedented in its strength, duration, and negative impact on sea life. It is one of those ‘we’ve never seen anything like this before in modern reckoning’ kind of things. Like the RRR and the worst in 1,000 years California drought that came with it, this blob is a severe anomalous event with wide-ranging impact. One that is clearly, to my mind, associated with climate change. Bostons’ snow pile from its epic winter still hasn’t melted. It’s looking pretty trashy but is tenaciously hanging on. How ironic while the arctic melts. The manager of it says he’s going to call it a glacier if it sticks around til December. Interesting article over on phys.org about where this oceanic heat has been hiding. The climate change deniers in comments is a form of scientific censorship. They block effective dialogue and discussion on what is probably the most important topic of the day, essentially crowding out honest discussion and alienating knowledgeable and helpful commenters. I know it takes a lot of effort (takes a ton of effort here), but forums that do not moderate out what is essentially a spam of propaganda and malinformation risk throwing their readers to the wolves. RS, thank you for all the time you espend to deal with the junk for the rest of us, picking the nits out of the web you weave. Just how many trolls come here, do they change names and attack you and what percentage are you throwing out to make this work? Do they give up easily? Are they dropping or increasing over time? Can you tell if any are bots and, if so, do you have any sense of the percentage. I just can’t believe they have as much commitment as we do without some incentive. They are all over every news in overwhelming and dispiriting numbers. I know CB goes after them. I’ve never seen an article about them and think there could be some great investigative journalism about it. Thank you. I guess what I am most curious about is if you feel it is ever organized and could that be determined or teased out forensically, especially for the comments areas of news sites. It certainly appears organized. Its form is a kind of combined puffery of denial memes by using a blanketing technique that probably includes both bots and paid commenters. Some can even be attributed to source based on message (I regularly see Heartland, AEI, and Berman memes, for example). There are some comments that fall into a gray area, but there are enough that do not to certainly make a forensic analysis worthwhile. I would start with a site that does not have strong moderation so you could cast the broadest possible net. A group of influential conservative members of the behemoth social media site Digg.com have just been caught red-handed in a widespread campaign of censorship, having multiple accounts, upvote padding, and deliberately trying to ban progressives. An undercover investigation has exposed this effort, which has been in action for more than one year. I also remember seeing a video where at some large conference (hosted by FreedomWorks?) people who chose to could take a class in how to manipulate social media by rapidly upvoting conservative stories downvoting liberal ones so most people wouldn’t even get a chance to see stories with a liberal slant. The people who took the mini-course were told to think of themselves as revolutionaries and patriots (like the Founding Fathers) when they engaged in this sort of activity. Unfortunately I haven’t has any luck finding the video today. I might try again later. Denier-bots live! Why are online comments’ sections over-run by the anti-science, pro-pollution crowd? Good catch, Tim. These guys have been at this for quite some time. Huge and reprehensible disservice to the public. Yet another thing that is easy to take for granted. Thank you for spending the time to moderate your blog Robert! Thank you real person Timothy Chase. Your sleuthing is excellent. We need updated laws and technology to deal with fictitious online representation and outright fraud. Artificial Intelligence will only magnify this campaign of false posting further. Add this new paper from Nature as another factor that slowed surface warming. It confirms a study from last year suggesting volcanoes had a stronger cooling influence 2003-2012 than previously thought. Lots of trouble in the pipe, it would seem. The article discusses negative PDO – now apparently turning positive – resulting in cooler top 10 meters of water 2003-2012, giving a negative forcing to surface warming. This brought to mind something I’ve been thinking for a while: at some point the PDO, AMO, and solar cycles (small but detectable effect) will positively coincide. Given the collapse of the Arctic, increased methane release, tundra burning, deforestation, et. al; it seems as though an aggregated ‘prediction map’ might be kind of useful in order to get a feel for when to expect abrupt, qualitative changes. Kind of like what we’re seeing this year, only worse. We should all hug and thank Senator Whitehouse of RI who just gave his 98th! weekly address on climate change. His speeches, regardless of short-term impact, are recorded for history to condemn the U.S. Senate. Peter Sinclair gives a synopsis. The Senator makes a compelling case for applying the RICO statutes to the Oil industry just like the Mafia and the Tobacco industry. Great job by Peter throwing light on Whitehouse’s fantastic and responsible rebellion against the fossil fuel cheerleaders that now dominate our Congress. Kudos to them both! Lets end the 97% meme here and now. James L. Powell, director of the National Physical Sciences Consortium, who reviewed more than 24,000 peer-reviewed scientific articles on climate change published between 2013 and 2014 concludes it is more like 99.99% with only 4 of the 69,406 authors rejecting human-caused warming. He explains his methodology on his website. Probably even closer to 100 percent if you take out those accepting funds from fossil fuel based industry. Thanks… That’s what I though… There is so much going on, that we can only be sure once we are there…! Add to the complexity of the situation the large pool fresh water sooth of Greenland, that create a local high bumping the anemic jet stream and I would not even bet 10¢ of predicting the next winter climate. Very strong nor-Easters in the North Atlantic this winter. Just to let you know, I updated my reply after taking another look at my notes. In other words, we are probably looking at a trough in the east regardless of what happens to the block. I will be ready this year. I sure do remember your last warning on coastal storms for me!! Those of us who live in Maine really, REALLY don’t want to hear this. Especially me. My driveway is about 1000′ long and I plow with a little 4-wheeler (ATV). It is a good system but it gets overwhelmed by any storm that dumps more than 16″. Nor’easters are good for up to 30″. Sigh. 865,000 people evacuated from Chan-hom’s impact zone, a wise move. 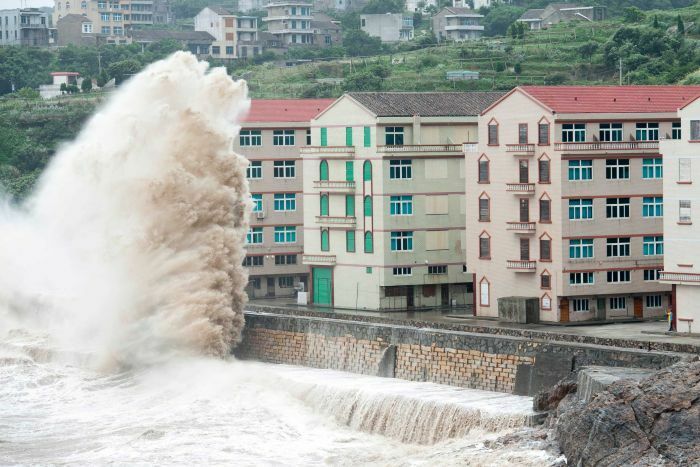 These are photos from the city of Wenling in China’s Zhejiang province on Friday, roughly a full day prior to the system crossing the coast. Some of this heat must have ended up in my area yesterday, according to my local Wunderground station. It was a dry 138.7 though. Bad sensor? It was the Silver Country Estates station – about 2 mi from my actual location. The new photo on Friday shows a visible satellite image with two distinct circulations in the dense smoke band over northeast Montana, North Dakota, Saskatchewan, Alberta and British Columbia, NWS forecasters said. And another 300,000 acres burned in Alaska today. 3.8 million acres now. Then that is about 468 square miles or a one mile stretch of forest running for 468 miles in length. Robert, what interaction between this upcoming el nino and the arctic ice melt for the end of this year, and then next year (and beyond) will there be? Primary influence now is to inject heat through the pacific NW and weaken ice on the Beaufort and Chukchi side. Niño years do not tend to be new record low years. But they do tend to be years of ice weakening. The record low years have come as the gyres spin up at El Niño year + 2. So 2017 is really the one to keep an eye out for. But this year can throw a surprise or two. Check your math, Greg. It’s still 640 acres to a square miles. 3.8 million acres is just shy of six thousand square miles. I think Greg is referring to the 300,000 acre daily burn, not the total burn. Thank you for yet another excellent post, Robert. I read all the posts and comments, though I do not make many comments myself. Others here are better informed and more eloquent than I am. That being said, this year is surely a historic one for all the wrong reasons. The “hiatus-that-never-was” has been shown to be a fantasy, just as many of us knew it would be. How could global warming stop even as the forcings kept ramping up? The obvious answer that the heat was going into the oceans was denied by the fantasists and their paymasters, the carbon criminals.Now we see a record hot year, probably an unprecedented El Nino, massive fires, stalled jet streams, a hydrological cycle that is causing devastation, and a rapidly collapsing Arctic ice cap. Repeated warnings of these dangers by scientists and others were not only denounced, but the messengers have been exposed to the most cowardly and vile character assassination by the carbon criminals and their political and pseudo-scientific whores. I shall be sixty-five in a couple of weeks. I have watched global warming go from a plausible theory in the 1950s, to a major threat by the 1980s, to a horrifying reality today. Keep up the good work. Someone has to keep banging the drum of truth in these sad times. We can see a lot of heat in the Pacific and understand that the Atlantic Hurricane season is going to be quiet but what about the Gulf of Mexico? The Gulf stream has slowed and will not be carrying so much heat away and the Gulf it in line with the Pacific heat. METOP IASI 2-A: An all time high global mean methane. Our greenhouse gas emissions are helping to spin up a giant vortex of winds around Antarctica. Antarctica has been warming relatively slowly compared with the rest of the world. The explanation seems to be that the winds spinning clockwise around the continent have been getting stronger, preventing warm air from entering. It is melting — from the ocean. And phys.org has this article. So now we know how much heating is rising up through the sediment in this one under-ice lake. Interesting dynamic at work here. And with the additional external GHGs we [read humans] have added to this has now upset the equilibrium. Not hard to see, even for this layman. I can see from the unmoderated comments that there are very many science-deficient people pretending to understand the complex, multi-input system we call climate (and I thank this blog for setting me on the right path…). 😉 However, there are a few stoic individuals that attempt to set things straight – but as Robert has commented, it’s quite a battle. Too bad there’s no moderator on phys.org to filter the idiocy. 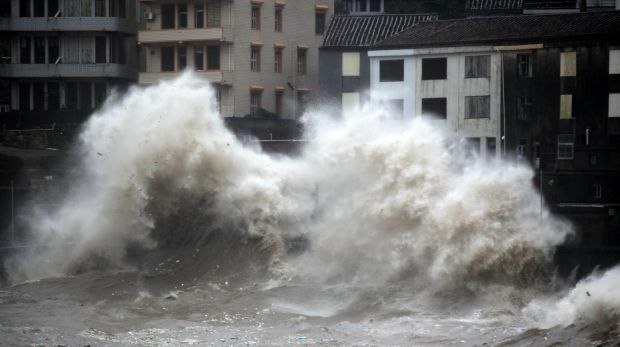 More than 865,000 people have been evacuated in eastern China, as Super Typhoon Chan-hom barrels towards Shanghai after lashing Japan’s Okinawa island chain and Taiwan. Isn’t there a couple more storms right behind this one? There’s actualy a good chance of SIX cyclones forming in the Pacific at the same time this week. A new expedition to the craters in Yamal, in northern Russia, shows how they have rapidly altered since they were first noticed last year, but also indicates the possibility that not all the craters were formed in identical ways. The holes – first noticed last year – intrigued and perplexed scientists from around the world, initially provoking a number of explanations as to their cause, the most outlandish of which was that they were caused by stray missiles or even aliens from outer space. Now the experts say the formation is something ‘never observed’ before, linked to warm weather in recent years. New pictures from the expedition are shown here, showing how one of the holes has rapidly filled with water in recent months. I wouldn’t say quite solved. Although it’s pretty clear all the extra heat is dynamically altering the way carbon moves about in the Arctic environment. Good updated post by the Siberian Times. There’s an obvious difference: 2015 shows a massive triangle of hot water covering the E Pacific while in 1997 there are only pockets of warm water, mixed with pockets of cool. With these major differences I’m not convinced the N Am weather patterns of 2015/16 will necessarily follow 1997/98. Clearly the weather patterns are not the same. We have unprecedented wildfires as a result of synergy between this El Niño and Climate Change. We have unprecedented drought in Brazil and California in the build up. During the beginning of the shift to El Niño, the U.S. Northeast got slammed by powerful Nor Easters. Alaska, during the same period experienced a Pineapple Express that featured its worst November storm on record. Pakistan and India have experienced hothouse mass casualties. Anyone paying attention can clearly tell that the climate impacts from this El Niño + human warming are worse than 1997/1998. The highlight comparison is that 2015 may feature a stronger El Niño than the record shattering one of the late 1990s. So don’t take an El Niño strength forecast out of context and consider it to be an El Niño weather pattern forecast. From jump we have written that impacts may be both different and more severe. All that said, the tendency of eastern seaboard Nor Easter formation during El Niño is pretty well documented as is trough formation in the east during those times. Add in screaming SSTAs in the backed up Gulf Stream and the likely T deltas are huge potential storm generators. Thank you for your reply. I agree with you; I was referring to the media in California. They’ve been running with the simplistic notion that Big El Nino means lots of rain and point to ’97 as an example of what to expect, as if nothing has changed in the last 18 years. Looks to me like we either end up with a maintained block and Alaska gets slammed with moisture that would have been earmarked for California or the block falls and we end up with a very terrible potential storm situation for the golden state. Summer is heightening the block now. But there is a good anomaly gradient starting to cut across the north central Pacific. This may hint at future block failure. We will know much better by Fall. The media should probably tell both of these stories and not just the one. 120W40N links to the SST anomaly charts for the 2015 and 1997 El Ninos. There’s an obvious difference: 2015 shows a massive triangle of hot water covering the E Pacific while in 1997 there are only pockets of warm water, mixed with pockets of cool. Actually I believe you may have this reversed. 1997 shows a broad triangle, 2015 shows something smaller and more patchy. I think a large part of the reason why models are now projecting something as strong or stronger is the warmer water at depth and the string of cyclones we have been seeing, including three at the same time and one in the southern hemisphere, something we have never seen before at this time of year. Cyclones mean Eichmann pumping. Combined with West Wind Bursts, these create Kelvin waves beneath the surface, going off memory, I believe at a depth of about 50 meters. However, Kelvin waves take several months to cross the Pacific. But the cooperation that we are seeing between the ocean and the atmosphere were moisture from the developing El Nino further feeds the formation of cyclones, resulting in a positive feedback loop. Additionally, there is currently a very large reservoir of warm water at depth, due in no small part to easterlies of unprecedented intensity in recent years. So yes, I believe 2015 will be considerably different from 1997. Incidentally, one indication of the build up of warm water at depth in recent years is Typhoon Haiyan in late 2013. Robert dealt with this in an earlier post. Yet more evidence of global warming at work. Read more here: …. “Due to an unusually windy day, wind farms in Denmark managed to produce 140 per cent of the country’s electricity needs. Just not to confuse electricity with energy. Not the same. Currently, renewables (wind and solar) are giving us about 2-3 % of ENERGY globally. Our consumption is simply too high. Wind and solar are the most rapidly growing energy source by capacity additions globally. Under proper policy we could clearly manage a 100 percent renewable energy civilization within decades. Under a crash program, we could do it in years. The wind energy potential alone is massive, an inexpensive non polluting resource that drastically reduces almost all externalities. Add in the plummeting price of solar and storage and there really is no economic excuse not to transition. Facing climate change, we have an imperative. One we’ve ignored for far, far too long. And also investment in small scale solar. I wonder if the CEFC can tell them to get stuffed and also whether this exclusion of small scale solar also extends to battery storage technologies for this type and scale of of energy system. They seem to be trying to promote large scale solar, perhaps as a deal done with the cross benchers who hate wind. Some of those like solar. Have not seen CCS mentioned as yet in the media coverage. The role of promoting emerging renewables should have been under ARENA’s remit but then Abbott and co did everything to gut that. The renewable industries need to get political and start campaigns in the Government’s marginal seats as they commenced during the RET review. There potentially is scope for Labour to attack and try and wedge them on renewables as well. Abbott and co really wanted to get rid of support for small scale solar but it turned out to be too costly politically during the RET review. Now trying to put a dampener one it via the directive to CEFC. So Phil, have you heard what these ’emerging technologies’ mentioned in the directive might be? Only heard large scale solar mentioned in media interviews – I think it was Hunt that mentioned that. Have not seen the directive. They might not have mentioned any new emerging technologies per se, just that CEFC can no longer invest in wind and small scale solar. I think any changes need legislative support, presumably by the cross benchers in charge of the so-called senate enquiry into wind. Was probably part of the deal Abbott did with those cross benchers in relation to the RET legislation although I would imagine some of them would not be too happy with small scale solar being lumped in with wind. CEFC have asked for legal advice. There is concern that they cannot meet other parts of the directive such as doubling the return while not altering the risk profile of their portfolio if wind and small scale solar is excluded. Increasing investment in emerging technologies must increase the risk profile especially if they cannot also invest in mature technologies. Of course, the Government is probably deliberately trying to set them up to fail as a pretext for then trying to close them down. That is the view of many financial commentators. Some weather and climate scientists are blaming the increase in fire activity on the developing El Niño weather pattern, saying it caused a dry winter and a hot spring. That’s despite improvements in firefighting technology and resources. This year isn’t a one-off because of El Niño, he says, but part of a larger trend driven by human-caused climate change. Way to go Mike Flanagan!! Finally some recognition in the mainstream press. But this should be in headlines everywhere. Here’s what we know about climate change: 97 percent of climate scientists (including me) are convinced, based upon the evidence, that human-caused global warming is happening. The popular narrative in the media these days, however, is that Republicans in Congress don’t accept this fact and that the GOP is in denial about the science around climate change. I have some surprising news: Everything you think you know about Republicans and climate change is a myth that I will now explode. Let the revisionist history begin! I suppose now that public opinion is swinging against them on climate change the republicans are in full retreat. And if someone can get the republicans to support the progressive fee and dividend carbon reduction plan, then I think we should probably nominate them for a sainthood. In other words, crocodile tears won’t make me believe it until I see it. What I do believe is that republicans will attempt to use climate change as a means for more transfer of wealth from the poor to the rich and from the public to the wealthy private few. These are the same republicans, after all, that are talking about canibalizing national parks and killing the EPA’s ability to ensure clean air and clean water for US citizenry. The same republicans who’ve put their golden idol ahead of public good on practically every issue from climate change, to wildlife health to cigarettes and beyond. The same republicans who’ve denied climate change for the better part of five decades. And now, with Alaska going up in flames during the hottest year on record they say — wait, we didn’t mean it, the free market can save us! Sorry, no, you don’t get a pass on that. You don’t suddenly put on the white hat and be the savior after basically drill baby drill, fracking things up in grand fashion. You don’t blame the liberals who’ve been warning you about climate change for years, whose pleas have all fallen on deaf ears. Until now, when you hypocritically say — well, if you give more to the rich, then maybe we’ll play ball on climate change. But if there’s some miracle and republicans support fee and dividend and don’t add the usual poison pills, don’t hold climate change policy hostage to wealthy special interests, then yeah, I’d say that’d be a great change for the better. That said, given republicans’ long record of terrible and irresponsible behavior I’m not holding my breath. A politicians job is to listen intently, nod their head and appear as though they are concerned about what you are concerned about. As you walk away, they forget you, as they never listened in the first place. They then return to their office and do the bidding of the lobbyists whom have paid the appropriate price. I don’t believe for a seconds that the good efforts of those people will amount to anything. The author does not know how these people operate. Great intentions, nothing changes. Regional fish managers said in June they weren’t overly concerned for the migratory fish – these temperatures would normally arrive later in the summer anyway. But only a couple weeks into July, the lower Willamette River is exceeding 78 degrees and the North Umpqua River at Winchester Dam reached 81.2 last week –the highest ever recorded at the dam. Now in its second year of drought, Oregon experienced another warm winter that left the mountains with little snowpack. Normally the snow would melt throughout the summer, its cool waters refreshing the rivers. Instead, the mountains are near-bare and unusually high June and July temperatures throughout the region are heating the waters quickly. “It’s moving farther upstream and the fish are dying even higher than we originally thought,” he said. Rod French, an Oregon Department of Fish and Wildlife biologist, reported Tuesday he found five dead sockeye in the lower Deschutes and about 40 that were stressed along one bank. French said that number is probably double elsewhere along the river and he cannot account for the dead fish that have been carried away by predators. Sockeye salmon found dying and dead recently in the Lower Deschutes River, near the Columbia River, were not headed up the Deschutes, said a state biologist. “These are not Deschutes origin fish,” said Rod French, fish biologist with the Oregon Department of Fish and Wildlife in The Dalles. The fish likely were from runs on the Columbia and Snake rivers, lured into the Deschutes by its cooler temperatures. Low water flows and high temperatures have combined to make the Columbia and rivers flowing into it warmer than normal for this time of year, French said. Being smaller than the Columbia, the Deschutes River cools down more at night. The cool waters likely drew the salmon out of the Columbia and into the first few miles of the Deschutes. Daytime temperatures of both rivers have recently been warmer than normal, French said, with water temperatures over 70 degrees. The Deschutes drops as much as 6 degrees each night while the Columbia’s temperature stays steady. – Oregonlive has been doing some very good stories of late. Oregonlive has been doing some very good stories of late. Yes they have, they’re this fish story like a duck on a June bug. – Here’s a bit pulled from the end of an earlier comment re China air pollution and weather extremes. Aerosol pollution is a large component of the atmosphere — local, regional, and global. It should, and must be factored in to all projections. I have run myself ragged for almost ten years emphasizing this. And Congress and the fossil fuel criminals be damned. … Fan worries that such effects are not being taken into account in weather forecasting. In China, for example, she notices that forecasts often give the wrong area for thunderstorms, which are likely to be downwind of where expected. Such forecasts also get the intensity “worryingly wrong,” she says. Tonight I am wondering what are all these smoke particles doing ? I mean the fires are like a huge industrial zone, has just popped out of the Earth. In a place we have never seen before. Up wind from the tar sands . This summer is shaping up to be one of the wettest on record in Indiana. And that means farmers across the state are being flooded with problems. A good portion of Indiana’s corn and soybeans have been heavily damaged by the rain. Some farmers have lost entire fields. Thanks, Bob. I thought it was you. And it is very good practice to read various links to get a more rounded picture. I do waters of the US delineation in Indiana. My observation is that entire watersheds (valleys) have been “plumbed” by agricultural drain systems. The natural waterways are essentially converted to a system of underground pipes (agricultural drains) and the drainage covered over with dirt to increase farm acreage (Clean Water Act exemptions for farming). What was once a network of wooded streams and wetlands is now farm fields, some drainage is underground but not sized for large storms. Could this near complete conversion of natural waterways and riparian buffers have contributed to the flooding? I think so. Less resiliency and more erosion in the altered landscapes. Altered to grow corn–more carbon at the expense of long-term sinks (forests). Friday night at sunset I was standing on top of Cadillac Mountain in Acadia National PArk in Maine. Now, Cadillac is only some 800 feet above sea level, but it has a commanding 360 degree view. I was awestruck at the amount of particulate in the air, and that is coming from someone who lived in Southern California in the ’70’s. I could even smell a bit of smoke. I tried to explain to my 16 year-old daughter that what she was seeing and breathing had started out as a massive forest fire in central Canada, and that it was a historic event. She nodded and then pointed out a group of “cute guys”. It seemed like a perfect metaphor for most of the communication work I try to do with the general public on this subject. Love it. Sense of humor definitely required for this business. Love Acadia, have been there multiple times. Latest University of Washington June PDO value is out, coming in at 1.54, up from the 1.20 value recorded for May 2015. The web address for these is: http://research.jisao.washington.edu/pdo/PDO.latest. A good run of positive values now and the ten thousand dollar question is whether the shift is temporary (e.g. a still in the cool PDO phase overall) or whether we are now in the next warm phase,. Looks Iike a very strong signal to say the least. – For a test, I just searched Google News with “Extreme Unprecedented Historic weather” input and in return got “About 28,000 results (0.45 seconds” (many are very recent). Someone here may have done something similar. Another interesting search is “weather whiplash” in quotes, e.g., extreme drought giving way to catastrophic flooding in parts of Texas and Oklahoma. Gave me 416 results. First Thankyou Robert for your work here – Apart from Robin (above) there’s very little info about climate here as gov is growing more wrong-wing daily. I dispute that claim, our Australian Conservatives are the superior ones, killing off wind farms and rooftop solar. Pushing for research into clean Carbon. Who shut the lunatic asylums when we need them.? Australia’s financial system is ill-prepared for the impacts of climate change, the Climate Institute has said. – The air (winds) not moving very much either for much of region. No wind — no weather — no change, just stagnation. WATERVILLE, Wash. (AP) — Officials in central Washington are encouraging 300 families to leave their homes in the path of a fast-growing wildfire. KING-TV reports (http://is.gd/BmdxjJ ) the Douglas County sheriff’s office issued about 300 evacuation notices Sunday morning to people living in the Palisades neighborhood of Waterville. Sheriff Harvey Gjesdal says those in the area should not wait for an evacuation notice, however, and move their family to safety if they see the fire getting closer. Fire officials say the Douglas County complex of fires, which started Friday evening, have grown to cover about 30 square miles. – Nitrogen threats and civil reactions ( wood chips in the wall act as a carbon source that creates a bacterial reaction, removing nitrogen) that only prevention (less introduced N) can forestall. A reactive barrier could be installed at Iron Point Park in Flanders, if Southampton Town seeks, and wins, a state grant, a potential test case for a way to cut down on nitrogen flowing into local waterways. If the town decides to move forward, it would join forces with Cornell Cooperative Extension to apply for the grant through the State Water Quality Improvement Project. The grant would partially fund a permeable reactive barrier, made primarily of wood chips, to collect nitrogen flowing underground into the bays. …a roughly 200- to 400-foot-long wall, buried completely in the ground, at an estimated $500,000 cost. The walls would be 4 feet wide, and as deep as 40 feet. The wood chips in the wall act as a carbon source that creates a bacterial reaction, removing nitrogen. The structure would be used as a research tool so Cornell scientists could determine its effectiveness, with an eye toward the potential for future installations elsewhere on Long Island. Increased nitrogen has been linked to hazardous algae blooms and fish die-offs, and without remediation could lead to serious ramifications for both local wildlife and the town’s drinking water supplies. ENID, Okla. — Work on the $1.3 billion expansion project at the Koch Nitrogen Company LLC plant east of Enid is progressing on schedule, a company spokeswoman said recently. ENID, Okla. — A $1.3 billion expansion of the Koch Fertilizer plant east of Enid is going along as planned, according to officials. Rob Carlton, Koch manager of business communications, said the expansion project is progressing on schedule. Completion is set for late 2016. Koch officials broke ground Oct. 9, 2014. I’m sure it’s clear to everyone here what we – humanity – need to do. The question is how will it actually play out? Some of you may like this for its various theological and scientific aspects. I don’t remember it posted here. Whenever I hear right-wing zealots proclaim they live their lives based on their Christian values, my head explodes. I take my blood pressure every day, but have to give myself some time to settle down after one of these idiots twist the Christian faith to fit their agenda. 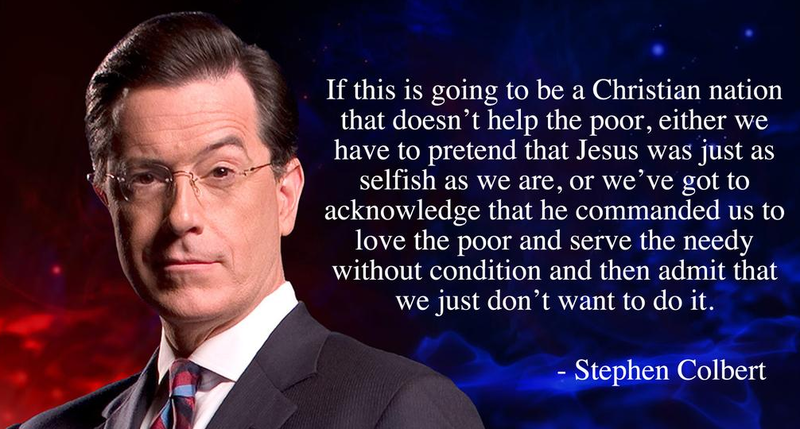 My wife can tell you how often I end up yelling at the television when some politician professes his love of Christianity and then ignores the number of children and poor in America who go to bed hungry each day. I don’t think there is one among the dastardly dozen running in the Republican primary who could endorse this basic statement on human compassion. As always, excellent posts and writing, Robert. And a giant thank you for what previous comments were concerning, and that is keeping this section free of deniers. I realize this must take a great effort on your part, but what it produces is priceless. This is the only (and best) place I know of where not only are comments reality based and enlightening, but others often expand on ideas presented here, and thus a positive and productive discussion occurs. Every other comments section is shut down and hijacked by fossil fuel trolls. It distracts everyone from the real issues, and forces honest, and sometimes naive people, to waste time arguing that the Earth is in fact round. What you provide to those of us really concerned with the changes underway cannot be properly captured in words. You help us even more than you realize, Robert. Looks like the prediction of a coming “Maunder minimum” is lighting up the intellects of the denial crowd. They will be counting sunspots as the world burns. We are in a worse state than was considered in 2011. Kilimanjaro ice loss means significantly more than tourists trudging up a mountain to get a bragging rights and inspiration for Hemmingway. Run off throughout the year supplies water for Lumi and Pangani rivers. These supply farms, river flora, river animals, wildlife watering, towns and villages. The majority of the runoff is used. As precipitation becomes more rain, less snow the result is lowered river depths, with interspersed high run off. All life that depends on the run-off thus suffers. You can see the change over time. This graph to me says “hmm… looks like less frozen stuff like ice”. In the links as I was looking into this mountain, I saw a link on google from Watts called “Kilimanjaro regaining its snow cap”. Sorry Tony, I’ll go with the physical evidence, not a well paid shill for corporations that put a few quarters worth of profit over the planet / human race. It’s funny that WTFUWT can see a recovery on Kiliminjaro, because I’ve noticed something similar on the ESRL website. CO2 levels have fallen about 2 ppm in the last 6 weeks and they’re still falling! A back-of-the envelope calculation shows me that the atmosphere will have NO CO2 whatsoever in 25 years. All plant life will die and we’ll all end up frozen in new ice sheets. Just as I was about to give up hope, I heard the blast of the final Trump, and the Donald swept in followed by a group of noble fossil fuel CEOs, who altruistically promised to burn much more FF, in order to save us all. Then I heard the alarm clock. 2,924,502 Hectares burned to date in Canada. That is 7,226,601 acres. 1,880,322 Hectares burned to date in the USA. That is 4,646,376 acres. That means 11,872,977 acres burned in North America so far in 2015, and it’s only mid July. As someone who resides in a small New England state, that statistic is simply staggering to me. The amount of beautiful forest lost to fire breaks my heart. 4.44 million acres burned in Alaska alone as of the most recent report that just came out a few minutes ago. For those that don’t know, the Martin Mars is a WW2 Mars class amphibious plane. It is amazing. It is 70 years old (yes, 70 year old WW2 aircraft). A total of 7 Mars class aircraft were built. It has a larger wingspan than a 747. 2 remain based in Port Alberni, BC. They were used in California a couple of years ago as well when the mega fires were raging. Anyone who knows / follows military aircraft should raise an eyebrow at this monster taking to the air to fight fires again. A real beauty with no contemporary! “The difference between Australia and a lot of other countries quite frankly, is when we make commitments to reduce emissions we keep them,” he said. 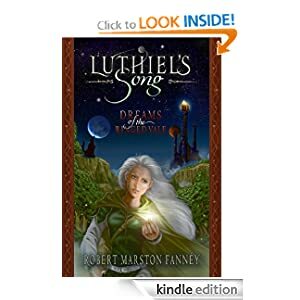 “Other countries make all these airy fairy promises that in the end never come to anything. So there you go rest of world, Tony Abbott reckons you can’t be trusted and you should lift your game – to his standard. Lead author Andrew Fisher, professor of Earth and planetary sciences at UC Santa Cruz, emphasized that the geothermal heating reported in this study does not explain the alarming loss of ice from West Antarctica that has been documented by other researchers. “The ice sheet developed and evolved with the geothermal heat flux coming up from below–it’s part of the system. 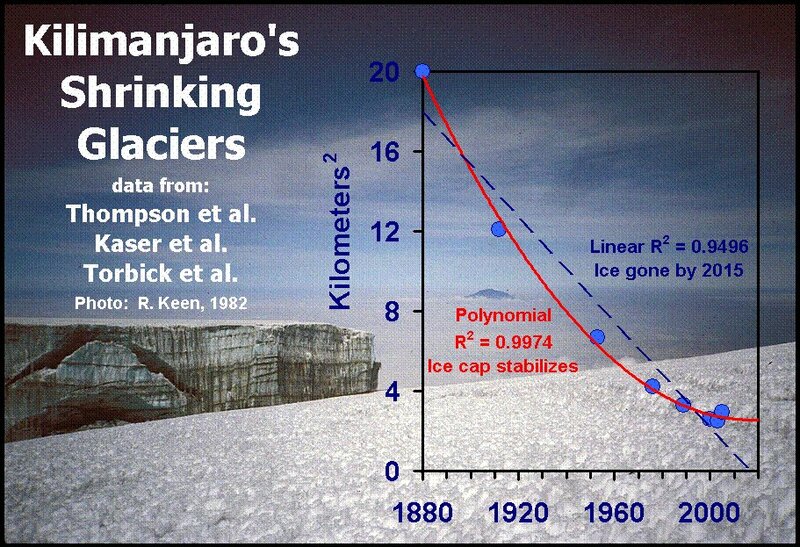 But this could help explain why the ice sheet is so unstable. When you add the effects of global warming, things can start to change quickly,” he said. Lake Erie’s most dominant form of toxic algae is not really an algae at all. Microcystis is a bacterium — called a cyanobacterium because of its blue-green hue — that mimics algae because of its color and characteristics. Although it is believed to be 3.5 billion years old — far older than the Great Lakes, which were formed from glaciers about 10,000 years ago — microcystis did not start to emerge as western Lake Erie’s most dominant form of algae until 1995. ………………………….. But in recent years, as populations have grown, land has been farmed more intensively, and Earth’s climate has warmed, microcystis has become a dominant algal species in many parts of the world. At Lake Taihu in China, microcystis can bloom nine months of the year, according to Hans Paerl, a distinguished marine and environmental sciences professor at the University of North Carolina-Chapel Hill, who has studied algae there. Tim Davis, a scientist with NOAA’s Great Lakes Environmental Research Laboratory in Ann Arbor, said that bloom in China is larger and more toxic than Lake Erie’s. In a normal year, Washington state’s Olympic National Park is arguably the wettest place in the continental U.S. An annual 150 inches of rain inundate the park’s western slopes, soaking the soil and slicking the branches of the lush temperate rain forest that grows there. Mosses, lichens and ferns festoon the trunks of centuries-old trees, whose thick canopy casts the forest floor into damp, dark shadow. The landscape has a primordial feel to it — cloaked in mist and swathed in green, it looks as though a dinosaur could come stomping out of the underbrush at any minute. But this is not a normal year. And all the suffering wildlife. It’s one thing for human civilization to take itself down, its another for us to take the natural world down with us. May we collectively wake up to the need for urgent action very soon. Peatlands — waterlogged, organic soils — have developed over thousands of years as carbon storage systems. In Southeast Asia, peat swamp forests cover about 250,000 square kilometers, a land area about the size of Michigan. Draining tropical peatlands for oil palm plantations may result in nearly twice as much carbon loss as official estimates, according to a new study. This is most definitely smoke haze near the pole. The Arctic ice is melting faster than ever recorded, the warmth tied to the emissions of modern life. But it is the ancient ways at the top of the world that are most at risk. BARROW, Alaska — A mile off the coast of the continent’s northernmost city, Josh Jones gunned his four-wheeler over ridges of buckling ice and through pools of turquoise water, where normally there would be a vast sheen of ice and snow. Escorted by an Eskimo guard toting a shotgun to protect them from roving polar bears, Jones and a fellow climate researcher were racing to retrieve scientific instruments that gauge the thickness of the ice, which they worried could be lost to the uncommonly rapid melt of the Arctic Ocean.  They were also in a race with much bigger stakes. Note where Lake Whillans is . Hundreds of miles inland from the edges of the ice shelves. Fish swimming over a bed of angular gravel at the grounding zone. The gravel and smaller sediments covering this seafloor fall out of the base of the melting ice sheet that is located here about 30 feet above the seafloor. WISSARD scientists observed in the several hours of taking video, a number of gravels and many smaller fragments falling down on the seafloor. This may be why benthic life (e.g. sea stars, sponges, urchins) has not established itself on this seafloor because they would be pelted by the rock fragments falling from above. However, fish are agile enough to avoid these projectiles as they take advantage of these seemingly desert-like feeding grounds. (Image credit: Deep-SCINI UNL-Andrill SMO). Natural gas is odorless unless odor is added. Hydrogen sulfide may be a possibility if the smell indication is ‘rotten eggs.’ Hydrogen sulfide is also explosive. Natural gas tainted with hydrogen sulfide would also have an odor. So, as an outside speculation, hydrogen sulfide+methane may be a potential culprit.